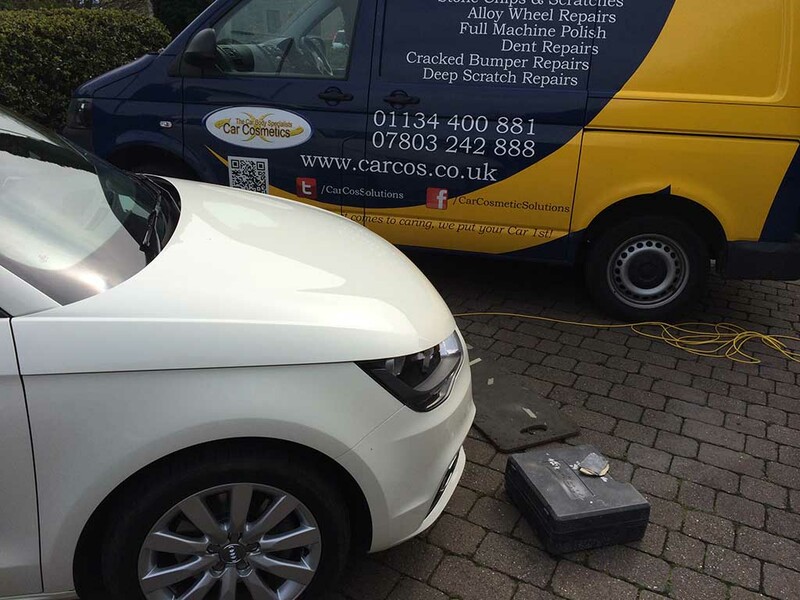 Car Cosmetics specialize in car body repairs in Mirfield and the surrounding areas. Getting in an accident in Mirfield can be a discouraging experience, especially for those of us who take pride in our vehicle’s appearance. Even minor accidents can leave your car looking old and beat up. Small scuffs or scrapes grab your attention and focus the eye on the damage. Luckily, Car Cosmetics specialize in car body repairs in Mirfield and the surrounding areas. We offer a mobile service to ensure you’re getting the best service possible without the inconvenience of having to come to a garage for the day. Wherever you are located in Mirfield, we can get your car back up to its former glory. All of our technicians are fully insured, highly trained automotive repair specialists. We don’t charge an overhead like you’ll find with many other auto body shop repair companies in the area. We take pride on the quality of work we perform, and you’re sure to be impressed by the attention to detail we put into each and every one of our repairs. You’re paying for a professional car body repair in Mirfield and you deserve the highest quality service available. Whether it’s minor damage or a whole panel replacement with color matching, Car Cosmetics is the right choice. we offer a variety of flexible services and plans as well. As we mentioned, we have a fully equipped fleet of mobile repair vans to repair your vehicle on-site whether you’re at home or work. We’ll also assess the damage on your car and provide a quote prior to beginning any work so that you don’t have any unpleasant surprises at the end of the day. We also strive to work with customers on a tight budget but still want their vehicle repaired and looking good-as-new again. We cater to all types of customers from individual drivers, fleets, and insurance companies as well. The services we offer include all types of auto body repair as well as dent removal, valeting, alloy wheel repair, and more. Car Cosmetics is a full service auto body shop with mobile services available as well. When it comes to removing dents from your vehicle wherever they may be, the best option is a paintless dent removal. Using our special techniques and tools, we’re able to effectively massage the dents out of your vehicle without any expensive material requirements. In many cases we won’t even need to remove the panel the dent is on. Our tools allow us to gently bend the dented area and carefully pull the dent back out to where it belongs. Once we clean the area off, you won’t be able to tell where the dent used to be! Technological advancements in auto body repair allow us to effectively and efficiently repair all manners of damage. Don’t get upset over dents and scratches; let us restore your car to the best shape possible – at a great price. nick, scratch, and scuff repair. We have the best resources in the industry to colour match and repair all paint and clear coat related damage. It’s important to keep your vehicle’s paint in good shape as the clear coat not only gives the car a nice shine, but it helps to prevent rust and damage to the materials your vehicle is made out of. Rust can get underneath your paint and spread from there causing significant damage over time if left unchecked. Simply keeping your clear coat in good condition can help prevent rust related damage while increasing the aesthetic appeal of the vehicle as a whole. Our colour matching experts are even able to repair the most uncommon of colours so you’ll never be able to tell where we repaired the damage. Get a hold of Car Cosmetics today to get a quote and schedule an appointment for all car body repairs in Mirfield related work. We look forward to hearing from you! Fill out the form below for any type of car body repair in Mirfield.